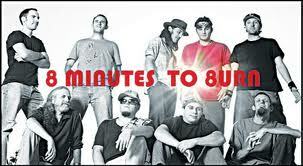 Electric Feel welcomes local group 8 Minutes To Burn in the studio Friday between 8-10pm. In anticipation of the release of Electric Li-Ion, the new forthcoming single from the funk-rock-reggae fusion band 8 Minutes To Burn and the Spring Tour promoting it, 8M2B Productions has teamed up with Electric Feel DJ's on KXCI, for a new DJ and Producer re-mix challenge. For full details on this re-mix contest go here.